Georgia Dunn Studio: Happy October Everyone! I skedaddled (can you believe that's a real word?) over to my sister's facebook page this morning and wrote, "GRACIE, WAKE UP!! IT'S OCTOBER!!! and pasted a link to Andy Williams' "It's the Most Wonderful Time". Living 3000 miles away in the computer age delights me. Facebook drives me up the wall many days, but at least it can serve as a playground for my sister and I where we can be as ridiculous as we always have been. I love the holidays. Yes, even boring ol' Thanksgiving! My birthday falls right in the middle of them. Halloween, Thanksgiving, My Birthday, Christmas, and New Years. How does it get better than that? Trick or treating, turkey feasts, birthday cake, ham dinners, cookies, pies, candy corn, candy canes! I gain at least ten pounds every year, and lose it through the spring and summer just in time to pack it right on again. It's glorious. Even more than the feasts and treats, I love holiday specials. 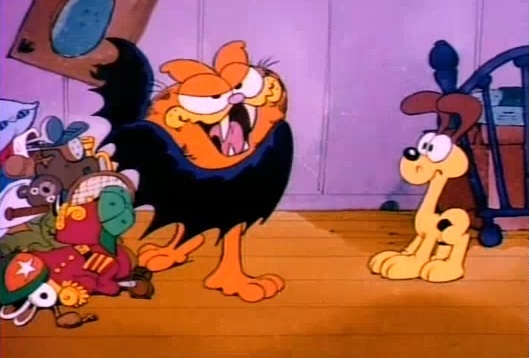 And Halloween has one of the best, that's right, "Garfield's Halloween Adventure". Or as we call it in our house "John Carpenter's Garfield's Halloween Adventure" for its notable similarities to The Fog. Like Odie needs a reason to be scared of Garfield. This special scared the wits out of me as a kid. And the songs are still the soundtrack of my Halloween. So what better way to kick off this great month, and the holiday season, than sitting back with a bowl full of candy corn (stop judging me) and watching Garfield vs Undead Pirates? Garfield 1, Undead Pirates 0.